Through a prayerful study of the texts associated with Mary, the Magdalene, including the (suppressed) gospel attributed to her, we discover Mary’s role in the life and ministry of Jesus, and what she fully embodied in that role. Specifically, Mary, called Magdalene (a title meaning “Great Tower/Beacon of faith”) embodied and lived out the fullness of the feminine principle. Came to know her Divine/ highest self through direct, personal experience (gnosis). Came to realize that the source of knowledge and wisdom resided within her. Experienced “salvation” through an initiatory process through which she came to know her most authentic self, her Soul’s purpose, and was freed of the inner obstacles to achieving this purpose. In other words, Mary came to know the “on earth” experience of the Divine kingdom. (Thy kingdom come, on earth as it is in heaven.). Experienced this process of knowing The Divine and knowing self through her inner, intuitive, visionary, creative, imaginative, physical, embodied, sensual and sexual faculties. Came to realize that her BODY was the literal temple of the Divine – the place where the Divine dwells and is known through the senses, feelings, physical and even sensual experiences. While we learn what Mary represented and embodied in her life and co-ministerial role with Jesus, we are also glaringly reminded of how quickly the embodied feminine was excised from the early Christian experience. 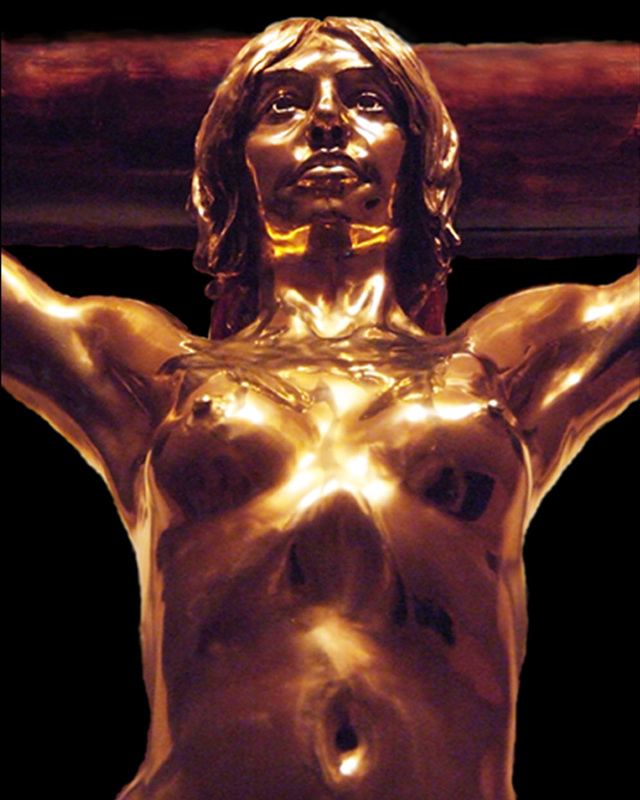 As my friend, Giedrius Plioplys says about his sculpture, St. Mary Magdalene Crucified, “I made her to be seen, to awaken people to the equality of women’s spirituality, and to demonstrate the misogyny of the “founders” of the early Roman church. Who crucified Mary Magdalene? St. Peter.” Amen brother. Mary Magdalene, and the feminine principle along with her, was indeed crucified by the founders of the institutional church. What is most ironic about this is that Jesus, who Peter et. al. claimed to have followed, also fully embodied the Divine Feminine, but in their haste to be rid of Mary, they denied that principle in their Christ as well and in doing so, denied the feminine within themselves and in all those who would follow them. We don’t need to look very far to see the carnage that has been brought forth through the denial of half of what it means to be human – both within institutional religion and in society at large. We have now been charged with the task of resurrecting the Magdalene and the feminine principle from the tomb in which she/they have been buried for the past 2000 (5000) years! This is not a feminist mission or for those only concerned with the Magdalene. This is also not about gender. The masculine and feminine principles reside within all of us and in their original nature are holy, loving, supportive and pure. This is a mission for all of humanity – for the sake of all we have left behind in denying the feminine principle. In denying the feminine, we have left behind half of what it is that makes us healthy and whole human beings – the intuitive, imaginative, visionary, creative, sensual, sensate and embodied paths of knowing. The Temple of the Magdalene seeks to resurrect the mission and ministry of Mary, called Magdalene. Learn about the Temple of the Magdalene Priestess Training HERE.